Based on interviews with Jimmy Page, the rest of Led Zeppelin, old girlfriends, tour managers, session musicians and more, Jimmy Page: The Definitive Biography by long-time Led Zeppelin aficionado Salewicz offers a fascinating insight into the life of one of rock's most important - and mysterious - musicians. In this extract, Salewicz delves into the myths and legends surrounding the cover art of Led Zeppelin's classic fourth album. Visiting a second-hand shop in Reading, on the way to Headley Grange with Jimmy Page, Robert Plant unearthed a nineteenth-century painting of a rustic character bent low by the burden he carried on his back. This figure, Jimmy would immediately have noted, bore a distinct resemblance to ‘Old George’ Pickingill, who it was believed had first instructed Aleister Crowley in the occult arts. Is this story true? Or was the image of this fellow created specifically for the album? Furthermore, although this rustic figure is considerably older, there is a distinct resemblance to the character in the tarot card the Ten of Wands. The Ten of Wands can be interpreted as the need to rise to responsibilities and pressure, which Jimmy Page certainly felt work on this new album was realising. ‘The cover was supposed to be something that was for other people to savour rather than for me to actually spell everything out, which would make the whole thing rather disappointing on that level of your own personal adventure into the music,’ he told James Jackson in The Times in January 2010, indicating how broad the levels of creative thought were that overhung every area of Led Zeppelin, the personal suzerainty of Jimmy Page. Each member of Led Zeppelin was represented on the sleeve by a sigil, a rune-like symbol, a clear reflection of Page’s occult interests, and also of Robert Plant, even if the latter’s were less obsessive: the singer’s fondness for the Viking oracle method of runes had been solidified on the group’s trip to Iceland. These were not archetypal symbols. But devised by each individual in the band. Both John Paul Jones and John Bonham took their sigils from Rudoph Koch’s The Book of Signs. Jones’s image was appropriately of an individual who possessed both confidence and competence. Bonham’s three interlocking rings represented the man, woman and child – of his marriage, presumably; twisted upside down, much to the delight of the rest of the band, Bonham’s image became the logo of Ballantine beer, his Midlands local brew. Robert Plant devised his own symbolic image, a feather within a circle, an icon that spoke very much of Native Americans but which the singer claimed was sourced from the ancient Mu civilisation. But what of Jimmy Page’s rune? The sigil that became known as Zoso, by which Led Zeppelin IV was sometimes termed before Jimmy himself adopted it as a kind of sobriquet? (He even named his own photographic autobiography, published much later, Zoso.) As might be expected from the ever precise and measured Jimmy Page, the origins of Zoso were considerably more arcane. In recent years it has become known that the world’s most prolific collector of paintings by Austin Osman Spare, sometimes described as Britain’s greatest unknown artist, is Jimmy Page. The work he has collected includes Spare’s 1907 Portrait of the Artist. It should not surprise you to learn that Spare was not only a visionary artist, but also a philosopher and occult musician; he was the inspiration for what is now known as chaos magic. One of Spare’s specialities were his sidereal paintings, as though you were looking at a cinema screen from the side. Looking at Spare’s paintings, you may receive similar impressions as you would when listening to the music of Led Zeppelin: images from the far, far past coupled with those from a distant science-fiction future – what you imagine and what you see are equally valid and interrelated. Also a writer, in his grimoire The Book of Pleasure Spare spoke of the Zos Kia Cultus, a philosophy of magic he developed that focuses on one’s individual universe and the influence of the magician’s will on it; a way of thinking – influenced by Aleister Crowley – that was very familiar to Jimmy Page. And Zos, of course, is only one letter away from Zoso. For his part Jimmy Page has often maintained that Zoso was intended purely as a representative of Saturn, the ruling planet of his Capricorn sun sign, the ruler of hard work, adamantine will and strength, and necessary strengthening restriction. The influence of Austin Osman Spare on Jimmy Page’s choice of rune – or sigil – seems rather clear. The occult elements of the sleeve were only followed through on the central gatefold image. A painting that was a re-working of the Hermit, the ninth card of the major arcana in the Rider Waite tarot pack, which represents Prudence. The staff the Hermit bears is a symbol of his authority. In its archetypal sense the Hermit, a reclusive, solitary figure, shines the light of a lamp on matters, and desires to give solitary time for thought to himself, whilst simultaneously not permitting others to stand in his way. The Hermit, from the Rider Waite tarot pack. It is worth bearing in mind that, as we see things coming to pass in the life of Jimmy Page, the Hermit, despite its positive and success-inspiring energies, is warning against the isolation that could be harmful to him at certain times: it is very important that he always endeavours to achieve the right balance. The Hermit invites us to discover wisdom and the progress that comes with study; the card also indicates that the Hermit is a person of integrity, but that he is scared to trust in others and completely express what he is feeling – very much as Jimmy Page was, polite to the point of sometimes being a little boring. 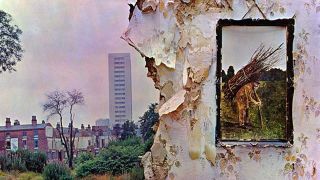 The painting of the Hermit on the inner sleeve was by a supposed friend of Jimmy Page’s called Barrington Coleby. There is no record whatsoever of any such person, and there were those who believed the real painter was none other than Jimmy Page himself. All the same, there was something very appealing and romantic about the notion of Jimmy Page as a rock ’n’ roll recluse, dabbling with potions and spells in his high tower. Jimmy Page: The Definitive Biography by Chis Salewicz is out now.